Wakesurf Vermont is the premier wakesurfing school located on the shores of Malletts Bay in Lake Champlain, Colchester Vermont. We offer hourly, half day and full day lessons during the summer behind our Centurion Enzo SV233 generating a MASSIVE surf WAVE with over 4000 lb. of ballast and 4000-watt water-rippling audio system. Whether you’re looking to try wakesurfing for your first time or have been carving it up for years and want to progress your skills, our USCG licensed captain and certified instructor, Greg Anderson, can help you ‘cut the cord’ and improve your technique in a safe and fun environment on Vermont’s largest and most scenic lake. We are fully insured to operate on Lake Champlain and specialize in wakesurfing, the world’s fastest growing water sport. We offer hourly, half, and full day rates and aim to provide an awesome day on the lake wakesurfing behind our boat with your family and friends! We’re excited to turn our passion for wakesurfing into an awesome outdoor experience we can share with Vermonters, visitors and VT summer guests. Our season runs from early June through late September, depending on weather conditions and lake temperatures. Contact us with any questions or by phone at (802) 828-SURF. If you live locally or are visiting the Burlington, VT area, make it a day on the lake us and book your wakesurfing lessons today! We’re located in Malletts Bay on East Lakeshore Drive just a short 15-minute drive north of Burlington and the BTV airport. 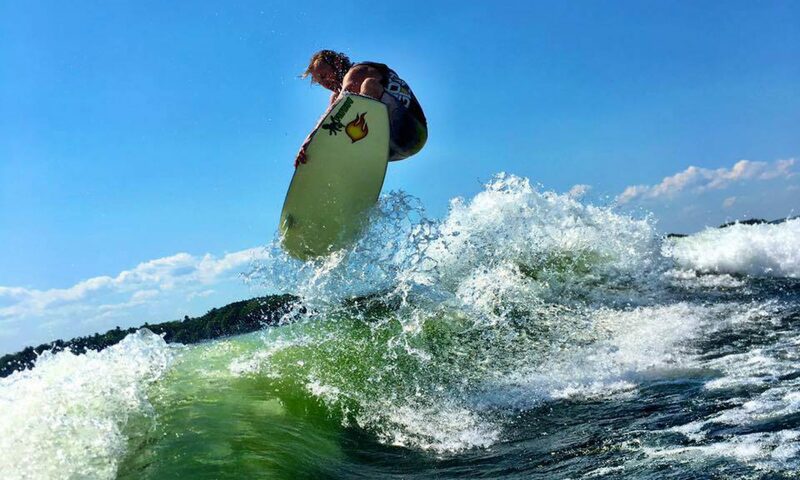 Surf, Sun & Fun on Lake Champlain | COME SURF THE ENDLESS WAVE!